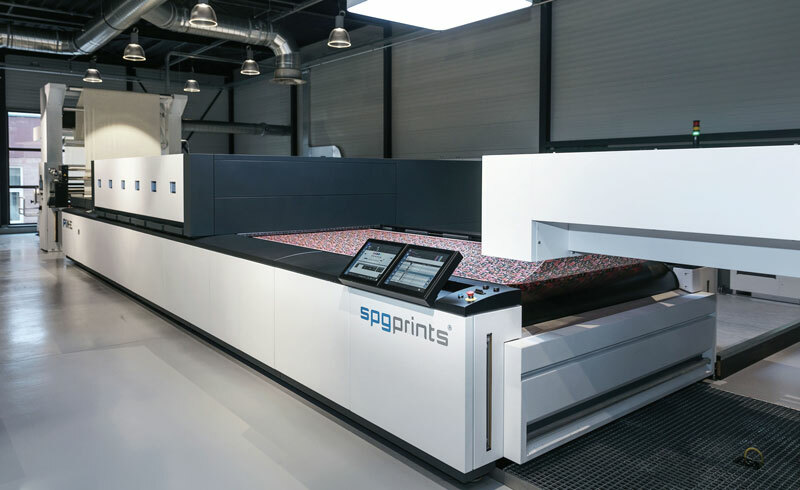 SPGPrints recently opened the Experience Center to showcase its digital printing technologies including the PIKE® single-pass printer. 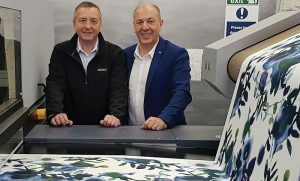 Stephen Thomas (left), managing director, Standfast & Barracks; and Martin Winkler, segment manager, Durst Textile Printing, reviewing fabric prints produced on the Durst Alpha 190 system. 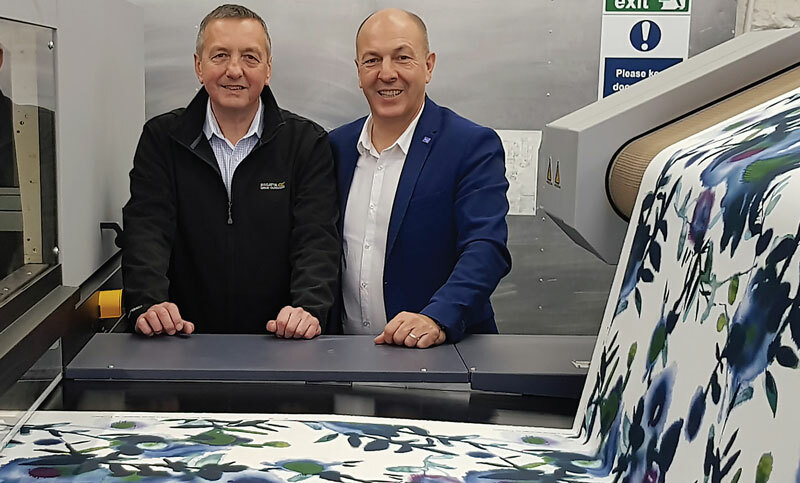 Italy-based Durst Group recently announced a partnership with England-based fabric printing company Standfast & Barracks for a Centre of Excellence. The center will be located at Standfast & Barracks’ headquarters in Lancashire. Standfast & Barracks recently installed two Durst Alpha 190 systems, which comprise a super high-performance multi-pass printer and the One-Step Pigment Ink Greentex P. The Alpha 190 can be configured in a variety widths and set-ups for fashion garments and apparel, home textiles and upholstery applications. The environmentally friendly One-Step pigment ink was developed for the Alpha Series and is based on the Durst Water Technology. Epson also announced a successor to its SureColor® F2000 direct-to-garment (DTG) printer, the SureColor® F2100, which will be available beginning March 2018. This high-performance printer features PrecisionCore® TFP® printheads and UltraChrome® DG garment ink system. Epson reports the machine is capable of printing at speeds that are up to twice as fast as its previous generation DTG printer with a consistent print quality. 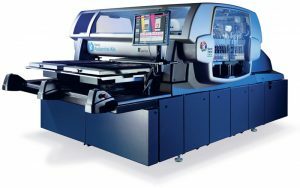 Features on the F2100 include quick-load platen for increased productivity; Epson Garment Creator software with tools for layout and text, color management, ink control, cost estimation and hot folders; and an integrated self-cleaning system with a fabric wiper and in-line cleaning cartridge to reduce downtime. The machine uses Epson’s UltraChrome DG inks, holding four colors plus white. The machine’s highlight white ink mode permits simultaneous printing of white and color inks on the color pass to offer increased image quality, speed and efficiency. According to the company, to lessen nozzle clogs and reduce downtime, the white ink is triple filtered prior to reaching the printheads. The SureColor F2100 is suitable for printing on garments — including T-shirts, hoodies, jackets and tote bags — ranging from 100-percent cotton to 50/50 blends, and comes with a one-year limited on-site warranty. Mimaki reports its Sb54/310/410 and Sb320/420 dye sublimation inks — suitable for team uniform applications, among other uses — have achieved the ECO PASSPORT certification from OEKO-TEX®. Suwanee, Ga.-based Mimaki USA introduced the 74-inch-wide TX300P-1800B direct-to-textile printer designed for sample runs or short-run pieces. The printer features an advanced belt transport and conveyor system to help feed stretchy and thin fabrics in a stable manner. According to Mimaki, new print heads with a high gap setting allow printing on thick or thin substrates, dimensionally unstable fabrics, woven substrates or substrates with raised fiber surfaces while maintaining accurate ink droplet placement. The company offers five types of ink that are optimized for the TX300P-1800B — Sb420 for direct-to-fabric sublimation, Ac400 acid dyes, Rc400 reactive dyes, Tp400 textile pigments and Dd400 disperse dyes. In addition, the printer features dual ink capability, which offers the user the option of printing on natural materials using pigment inks, or printing on polyester fabric using sublimation inks, using one machine. Mimaki also announced the Tiger-1800B printing system now is available in the Americas. The 74.8-inch-wide machine is offered in a direct-to-textile or transfer dye sublimation model and is suitable for large-scale production and high-volume textile runs. 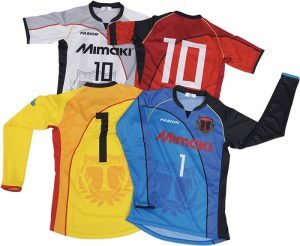 The direct-to-textile version features 16 printheads in a staggered arrangement, while the transfer dye sublimation model houses 8 printheads. According to the company, the Tiger-1800B is capable of printing at speeds of up to 4,144 square feet per hour. Kornit’s new Avalanche HD6 technology reduces ink consumption by up to 30 percent compared to the current R-Series Avalanche Hexa and by up to 46 percent compared to the previous non-R-Series version. Israel-based Kornit Digital has launched a new HD printing technology for its Avalanche direct-to-garment printing systems. The HD6, the successor of the Avalanche Hexa, features Kornit’s HD print engine, NeoPigment™ Rapid Ink, as well as six color channels plus white for a wider color gamut. The HDK, which is a HD version of the Avalanche 1000, has four color channels plus white. Kornit reports that the machines deliver a significant drop in cost-per-print via reductions in ink consumption of up to 46 percent compared to previous recirculated and non-recirculated ink technologies. The NeoPigment Rapid inks — which were developed especially for its HD technology, and meet environmental standards including Oeko-Tex Standard 100 and GOTS V5 pre-approval — offer improved gamut for spot and brand color matching, increased opacity and saturation of white ink, and improved fabric hand. 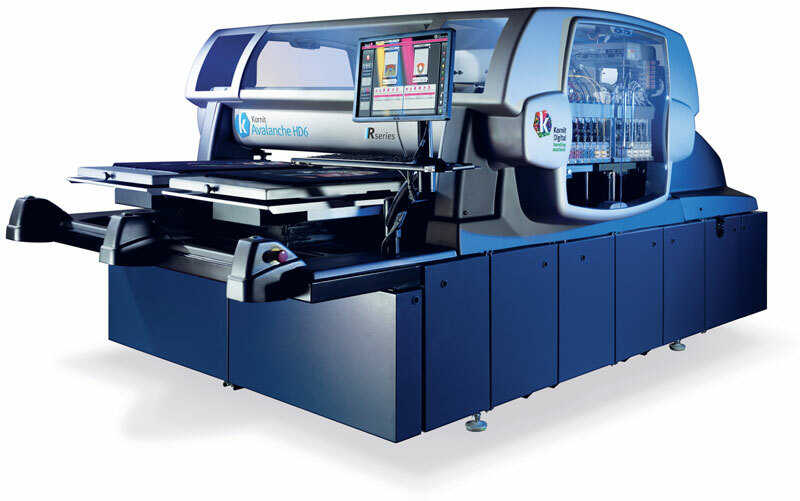 Previous versions of the Avalanche Hexa and Avalanche 1000, with or without ink recirculation technology, may be upgraded to the new HD technology to allow customers to take advantage of the NeoPigment Rapid inks. Tustin, Calif.-based Ricoh USA Inc. and AnaJet — a wholly owned subsidiary of Ricoh Printing Systems America Inc. and pioneer in DTG printing — will launch the cost-effective RICOH Ri 100 compact DTG printer in the United States this spring. Small enough to fit on a desk or countertop, the printer — which prints up to 1,200 by 1,200 dots per inch in vivid mode — is geared toward small business-use for branded items such as T-shirts, canvas bags, pillows and other such textile items. According to Ricoh, the printer was created for cost-effective one-off and short run prints to help manage supply and demand. Customers can use Ricoh Design Software to create and print designs, or choose to work with an RPCSdriver to utilize a software program of their choice for printing. The machine also features a heating system that creates a smooth printing surface by removing wrinkles from the fabric, and then cures the ink after printing. 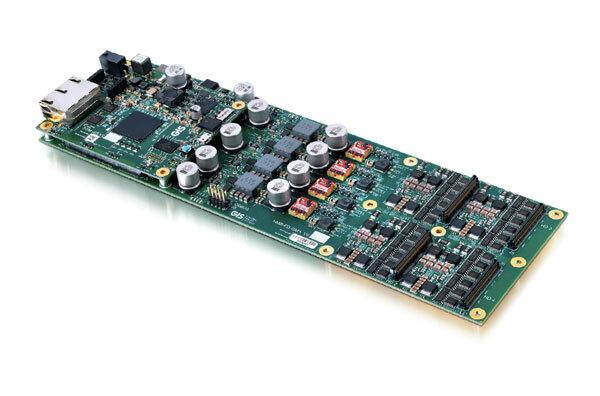 GIS has engineered the HMB-FD-GMA Head Management Board to support the Fujifilm Dimatix Samba GMA 33 and GMA 99 printheads. England-based Global Inkjet Systems (GIS) has introduced a new HMB-FD-GMA Head Management Board to support the Samba GMA 33 and GMA 99 printheads manufactured by Santa Clara, Calif.-based Fujifilm Dimatix. GIS reports the board can drive up to 4 printheads, and work in conjunction with the GIS Atlas® Machine Control Services (MCS) software. The HMB is based on GIS’ new Ethernet platform, which integrate datapath buffering, printhead management and fire waveform generation. Designed for scanning applications including textiles and soft signage, the Samba GMA 33 and GMA 99 printheads offer 300 dpi native resolution, 384/1152 nozzles and a 5 picoliter drop size. Fremont, Calif.-based Electronics For Imaging Inc. (EFI), a long-time player in the digital printing world, strengthened its portfolio when it acquired Italy-based Reggiani Macchine in 2015. EFI Reggiani has continued to innovate technologies for digital textile printing, and most recently introduced the EFI™ Fiery® Textile Bundle design and production workflow products to complement the EFI Reggiani digital inkjet printers. The bundle includes Fiery DesignPro plug-ins compatible with familiar programs Adobe® Illustrator® and Photoshop® to assist with design creation, as well as version 6.5 of EFI’s Fiery proServer digital front end (DFE) for color consistency in production workflows. Kiian Digital, a brand of Italy-based JK Group S.p.A., recently introduced Digistar Bravo disperse inks for direct printing. The range features 11 colors including two blacks with deep intensity, and high rubbing and lightfastness. 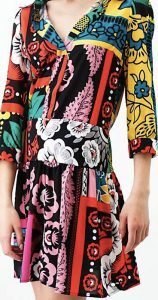 Kiian reports the inks were created with industrial textile printing needs in mind and they offer high runnability as well as printing performance. “Digistar Bravo is part of Kiian Digital’s branding strategy to meet the cutting-edge demands of commercial digital textile printing; bringing together the highest quality inks with global support,” said Alessandra Borghi, sales director, Kiian Digital. Sensient’s new ElvaJet® Opal digital dye sublimation inks feature a new dispersion technology for improved color, latency and print performance. Switzerland-based Sensient Imaging Technologies, a division of Sensient Technologies Corp., recently introduced ElvaJet® Opal digital dye sublimation inks and Xennia® Emerald PC digital pigment inks. According to the company, ElvaJet Opal achieves improved color, latency and print performance through a new dispersion technology. The inks also are easy to install and use over long production runs and have low maintenance requirements. “Our world class team of ink designers created Opal from the bottom up, starting with a revolutionary core dispersion technology,” said Mike Geraghty, president, Sensient Colors. “We have increased the color strength of the Opal inks and maintained the Sensient signature black shade. The ink is suitable for direct textile printing applications. “Key to the performance of Emerald PC is including a binder within the ink whilst increasing color strength at the same time as maximizing open time and latency,” said Dr. Ian Whitehead, innovation director, Sensient Inks. Both ElvaJet Opal and Xennia Emerald PC inks are formulated for Piezo-based printers and may be used for fashion, sports apparel, home textile, and sign and display applications. Designs by Emilio Mata were featured in Epson’s 4th Annual Digital Couture Project. The fourth annual Epson Digital Couture Project was held recently in New York City. 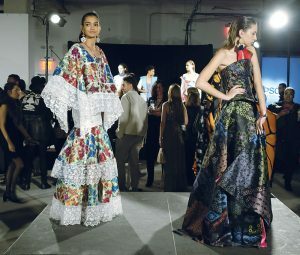 Under the theme “Cosmopolitan Couture With Impossible Colors — How Does Your Culture Dress Up?” thirteen designers from North and Latin America created textiles using Epson’s dye-sublimation printing technology and used the fabrics in couture garments. Before the fashion showcase, Epson hosted a Fashion and Technology panel to discuss market trends and how digital technology is evolving the fashion industry.